For two quarters, the Portland Trail Blazers appeared to be in danger. Orlando Magic's visitors, led by eight at half-time, shot 57% of the three goals and 55% overall. The Blazers had tough times in the third quarter. Then Damian Lillard decided that he had enough. 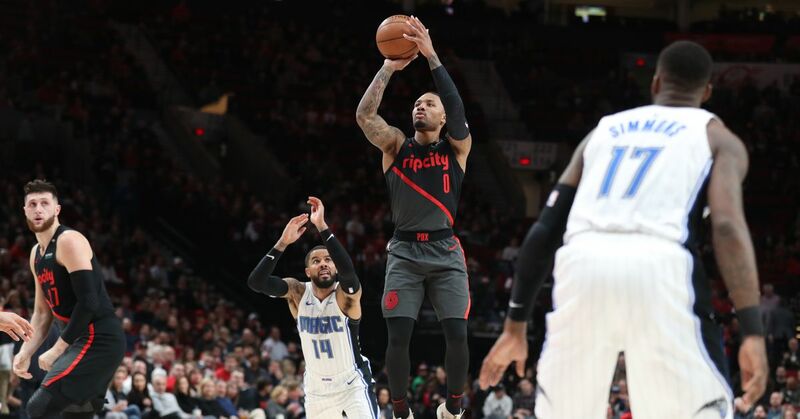 Lillard scored 7 of his team's 10 selections in the third quarter as Portland stormed the Magic en route to a 115-112 home victory on Wednesday. Orlando fought to the last whistle, the Blazers held them back in the end. Lillard was previously tied for the team record of nine trios with Nicolas Batum. Lillard managed the feat for the last time on April 8, 2017 against Utah Jazz. Lillard scored 41 points overall, while the Blazers scored 40 points in the third quarter, a peak in the season. Jusuf Nurkic had 16 points and 13 rebounds. Nikola Vucevic scored 20 points for the Magic. Portland coach Terry Stotts earned his 400th career victory. Here are some takeaways from tonight's match. Lady's dominance: Lillard was on fire for most of the third quarter, scoring 23 points. Even when the rest of the team was struggling on the ground, Lillard refused to let the faithful go home. An aid to start the sauce: Nik Stauskas carried the charge in the first half for the Blazers, scoring 15 points on 5 out of 9, on three shots before half-time. The perimeter is a pesky problem: Orlando is the seventh team in the last eight games to surpass the season average of three, 47.5%. At this point, the opposing team simply lucky can not be an acceptable excuse. The Blazers welcome the Denver Nuggets on Friday.